The Minolta Disc-7 Camera was one of a series of compact camera types that appeared around the 1980's, working with a disc of 15 exposures in a cover, once loaded the frame is advanced (turned) to the first frame, if the disc is removed before being fully exposed a frame is lost, but the other frames are still kept. The Camera has an internal battery that can only be changed by the Manufacturer, on the front is a curved mirror for self portrait use, it has two shutter speeds, built in flash and self timer, and f2.8 lens at 12.5mm focal length fixed focus with Macro mode. Exposure is automatic. 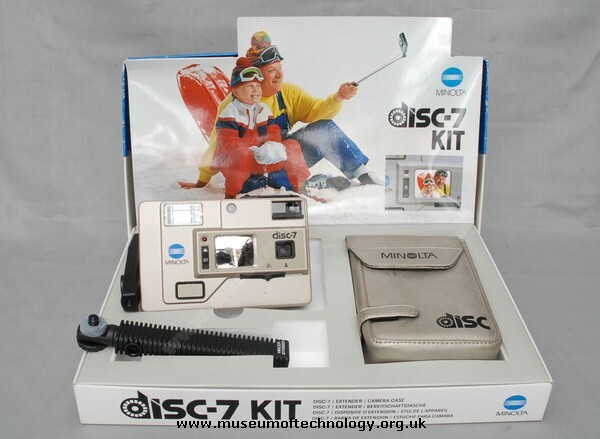 The Minolta Disc-7 camera in the kit form, as shown, had a removable "selfie stick". This is probably the first, and only, example of a "selfie stick" on a film camera, as shown on the box lid. The "selfie stick" was telescopic and can be seen as the black "handle" at the bottom left. Shutter release was via an electric cable between the handle and the camera. The camera was not a success, partially due to the small size of the disc film negative (10 x 8 mm).